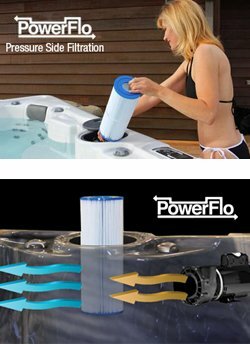 Reliable and virtually self-maintaining, PowerFlo™ filtration most effectively utilizes power from the jet pump to clean and sanitize every drop of your spa water. While others pull dirty water over open, visible filters on the pump suction side, through the pump and back into your spa, the PDC PowerFlo™ design positions the filter on the push side of the pump to efficiently maximize pump power for cleaner water. Used water and surface debris is captured through waterline and bottom safety suctions and sent to the pump, where the power of the jet pump forcefully pushes the dirty water through a deep pleated filter cartridge, capturing all dirt and contaminants. 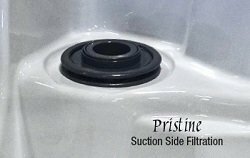 The filter is concealed within the spa shell, hidden from view so all you see is polished crystal clean water returned to your swim spa or hot tub; no muss, no fuss. Standard on Luxury, Premium Series and TruSwim® swim spas. The PDC EverPure™ ozone system produces pure ozone, nature’s powerful oxidizer continuously destroying organic and inorganic contaminants instantly. The EverPure™ system is cleansing your hot tub water whenever the pump is filtering, is completely silent and costs pennies a day to operate! Your hot tub water is scrubbed clean by the filtration system, combined with EverPure™ ozone and returned pure, clean and crystal clear through the ozone jets. Standard on all hot tub models. This powerful combination of ozone and UV-C is proven to deliver more sanitizing power for a better quality water. 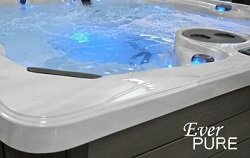 The PDC Spas EverPure2™ system utilizes a C rated lamp featuring a germicide wave length specifically for hot tubs and swim spas. This powerful advanced oxidation process is proven effective and widely used in the purification of drinking water. EverPure2™ naturally purifies while requiring less maintenance and use of harsh chemicals. Standard on all swim and fitness spa models, optional on Luxury Series models. Learn more. 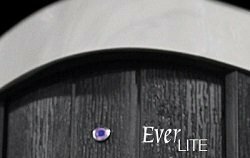 Here at PDC Spas, we go one step further than other brands with our exclusive EverLite™ and EverLite2™ ozone indicator lights. No more guessing if your purification system is hard at work, only a quick glance and rest assured your water is clean, pure and ready for that much deserved relaxation. EverLite™ on the cabinet corner and EverLite2™ sight glass on cabinet sidewall.